If you own this very desireable coupe, you will already have experienced some pretty wild characteristics. In particular, the ride quality over bumpy B roads? It's hard to understand the who, why and what BMW were thinking of. We think they looked at the M135i and turned the "sportiness" knob round to 9. We think the suspension was set up by the marketing department who mistakenly believe that sporty means stiff and over-aggressive. Body control (control being used in loosest of ways) is non-existent and the huge vertical accelerations at the rear when encountering a bump not only causes loss of traction in a straight line, but causes the driver to automatically pull back on the throttle, making 315hp completely redundant. Our B-Seris suspension uses properly judged and unique road springs coupled with Bilstein based shock absorbers specially deigned and tuned to the renowned Birds formula. Uniquely, we also tune the "additional dampers" to afford good slow speed ride quality and providing some additionl roll stiffness. Or Birds newly released 400ps engine management software? 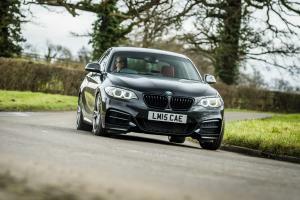 Developed on our own demonstrator M235i and 435i over the last 2 years, when coupled with the renowned Quaife limited slip differential and Birds B-Series suspension package we relish the proposition of a back to back test with the BMW M2. It will be completely monstered. As with all out tuning propositions, you can choose from an extensive list of individual enhancements, or perhaps treat your self to a full B-Series complete conversion. All of our solutions carry manufacturer matching warranties.